How do I upgrade my free Basic account to Pro or Business plan? To upgrade your free account to Pro or Business plan, just click on the red “Upgrade” button on the left sidebar of the dashboard after logging into your account. 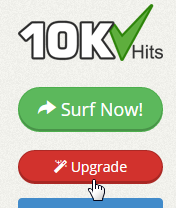 Click the “Upgrade Now” button for the plan you wish to subscribe to. On the Review Your Order page, you’ll be able to add a promo code if you wish. When you are done, you can pay by clicking on PayPal or Payza subscribe. After payment, you will be sent to the Purchase Successful page where you should go to account overview to see your updated plan. How do I upgrade my Pro account to Business plan? To upgrade your Pro account to Business plan, just click on the red “Upgrade” button on the left sidebar of the dashboard after logging into your account. Click the “Upgrade Now” button below the Business Plan. Depending on how many days are remaining on your Pro account, you’ll receive a pro-rated discount/credit for upgrading to business plan for the first month. How do I view the white-label traffic and geo-targeting options on a Basic account? When you are adding your website on a Basic (Free) account, you will see the Show / Hide panel to toggle between the basic settings and paid options. The panel is found after the Hits Limit settings. Click the panel to expand it and view the options available for Pro and Business accounts. You can close the panel by clicking the Hide Pro / Business Options panel. If you want to use the white-label traffic options, you can upgrade your plan to Pro or Business. If you want to use the white-label traffic and/or geo-targeting options, you can upgrade your plan to Business. Click the Upgrade Now! link to go to the Upgrade page.